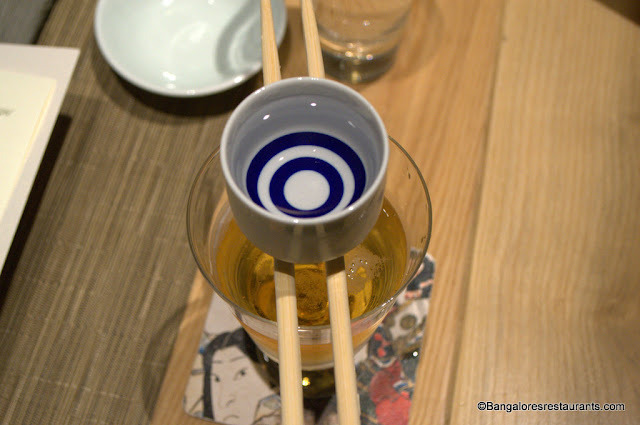 All you need to do is ask the question on any form of social media and the answer is almost unanimous - the best Japanese in Bangalore is at Edo at the ITC Gardenia. I had the privilege of visiting Edo at its launch a few years ago and the meal remained among the top food memories I have for this city. I visited another time, when the bank balance showed that I could afford the splurge (there is no hiding that about Edo - that it is an expensive place). We were recently invited to visit Edo again for a specially organized 7-course indulgence and of course we took up the offer. 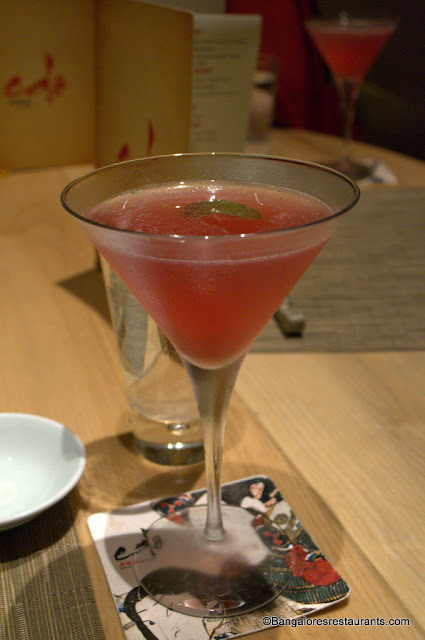 This meal was a showcase of the restaurants specialties, each of which were paired with interesting Soju based cocktails. 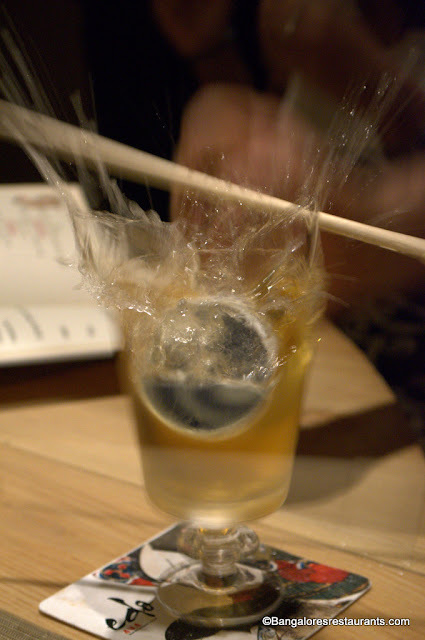 Of course, to break the ice and lighten the mood, we had to begin with a Soju Bomb. Much like a Teppanyaki counter, this is entertaining drama, but at your table, with you being part of it. A glass of beer is placed over the table and a soju cup (a substantial portion mind you) is balanced on two chopsticks of the glass. You count to three in Japanese (the chef or the staff will guide you through it) and bang the table on the count of three. The chopsticks give way, the soju cups drowns a happy death in the beer, a few drops splash over you and then you pick up the glass and don't put it down till you drain it to the last drop. You have to wait a few minutes before you feel the heat of the alcohol and the wave of happiness wash over you - much like what you feel after some beer and 2 shots of tequila. What a way to begin the meal! a drink has been downed. 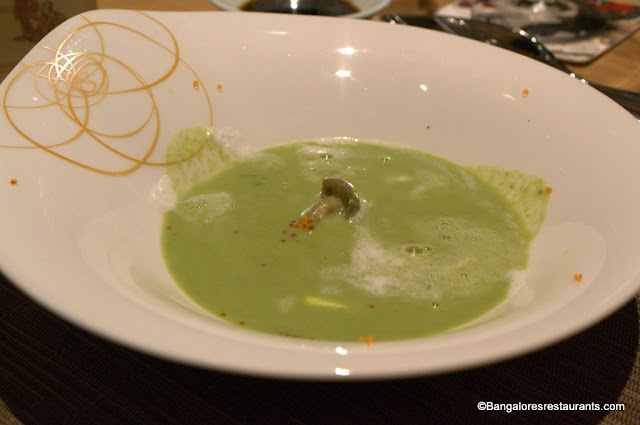 Course 1 - Zensai - Masterchef Kamlesh believes in making his food look as good as it tastes. From left to right - Aigamo Butter Ponzu (Duck breast cooked sous vide and flavoured with shiitake mushrooms and butter). 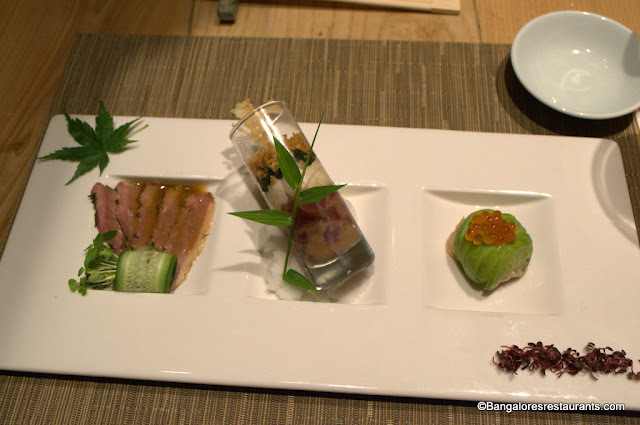 In the middle was the Yellowtail with Shisho, layered beautifully in a slim shot glass and finally some beautiful Fatty tuna wrapped in slivers of avocado and topped off with salmon roe. Where do I begin with this dish - the duck breast was delicate to say the least with the flavour of shitake coming through nice and strong and the butter ponzu wrapping it up beautifully. The Yellowtail shot glass, which Chef insisted we dig down right to the bottom for every bite, brought out the fresh flavour of fish in every bite ever so delicately. The Fatty tuna and the avocado was a mouthful of sheer indulgence - two rich textures coming together in such a away that you will take your time in savouring the bite and letting it go down. 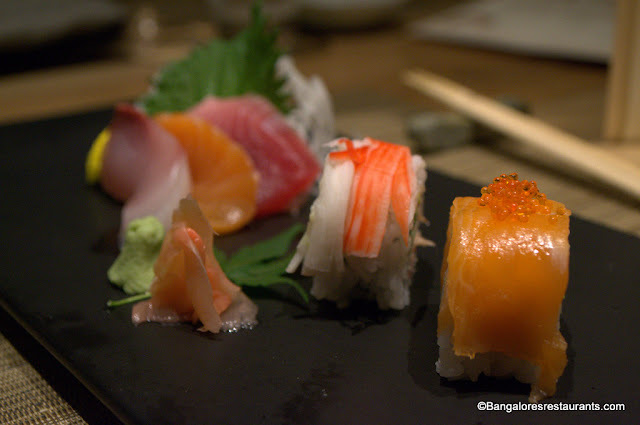 Sushi and Sashimi - two of the most misconceived Japanese offerings in India. There is so much of versatility that a platter of sushi and sashimi can offer you. On this night we had sashimi - sliced finely, of Yellowtail, Alaskan Salmon and Tuna Chitoro (the fatty portion). Among the sushi we sampled the Sweet Shrimp Nigiri, the Samurai Rainbow Maki roll - Sushi and Sashimi always brings Cheshire cat like grins to my face and this little platter was no different. 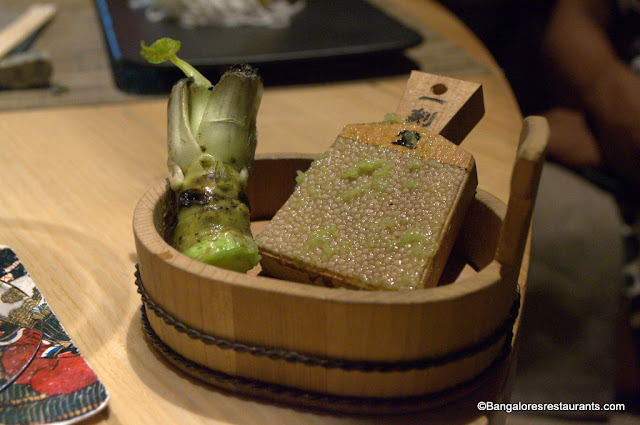 What I have always appreciated at Edo is the fact that the Wasabi root is grated at the table and served to you. Of course, you have the processed version of it as well. But real wasabi does not smack you at the back of your head like a sledgehammer, it lightly pats you on the face eliciting happy feelings. The freshly grated one does just that. Next came the Edamame Soup which you see across two pictures - You are served a plate that gives you the base - fresh Hokkaido scallops, edamame, roe and mushroom. In it you also see some Tobiko spices. Over this is poured the Edamame soup. 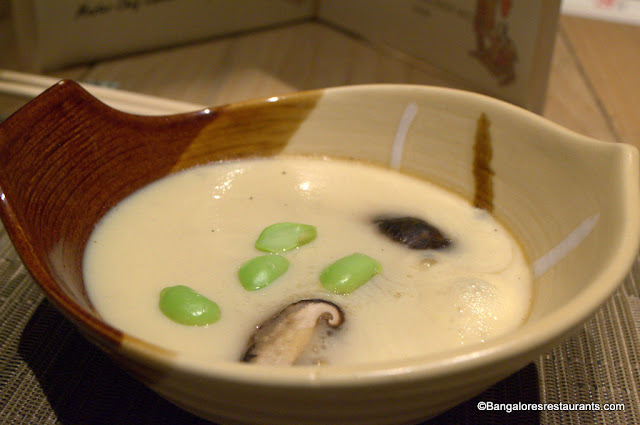 The Edamame Soup is light to taste, but packs an amazing amount of flavour, especially from Shiitake mushrooms. For a table of people that rarely fills up on soup - we sipped down every last delicious drop and not to mention the fabulous scallops. 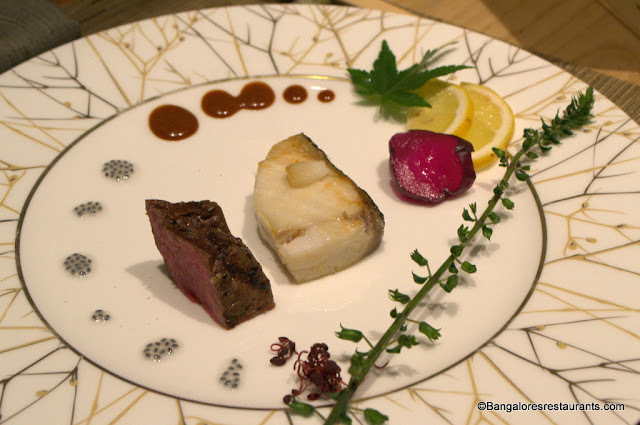 Moving on to the Yakimono Course - We had the Gindara Miso Zuke or Sweet Miso marinated Black Cod and the Gio Shioyaki - Angus Beef skewered and cooked on the Robotoyaki with no sauces, yet packing an amazing amount of flavour that only Angus beef can bring on. 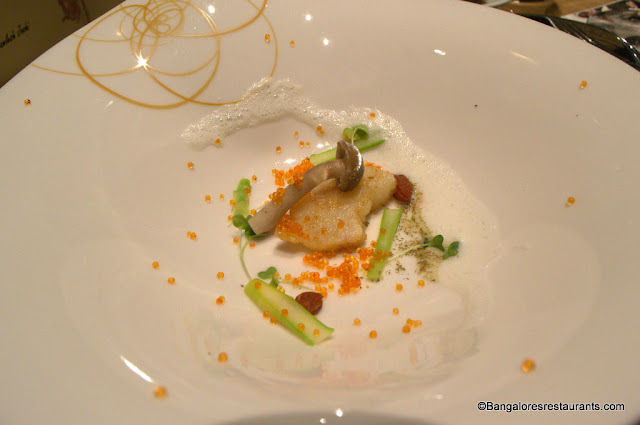 Surrounding the plate are little drops of basil leaf seeds and a sprig of leaves, pungent to taste. Both were great palate cleansers. Next was the Mushimono - A savoury egg custard with Unagi - called Chawanmunshi - quite gelatinous in texture and on the palate too - while it did taste mild, for me it definitely falls in the category of acquired taste. The base for this dish is a lovely dashi, and that is where all the flavour emanates from. 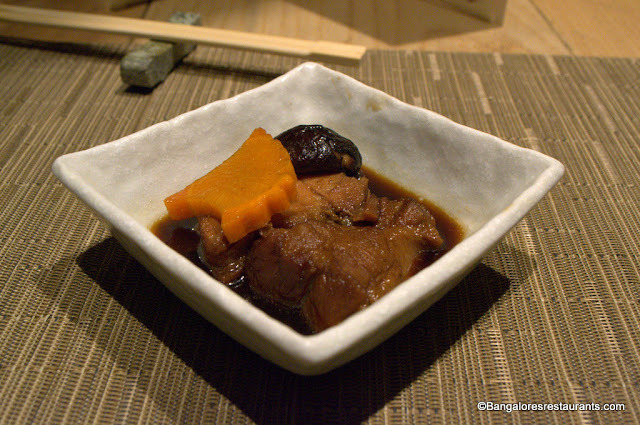 Next up - the Nimono - Kuro Kuta Kakoni or the Slow Braised Japanese Pork Belly - A little bowl of divinity that does deserve a place at the altar of the porcine Gods. Enough said! 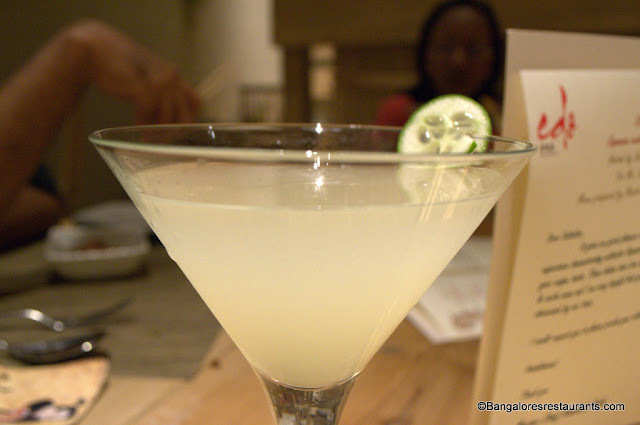 Somewhere in between we had the Cucumber and the Ginger Soju martinis. 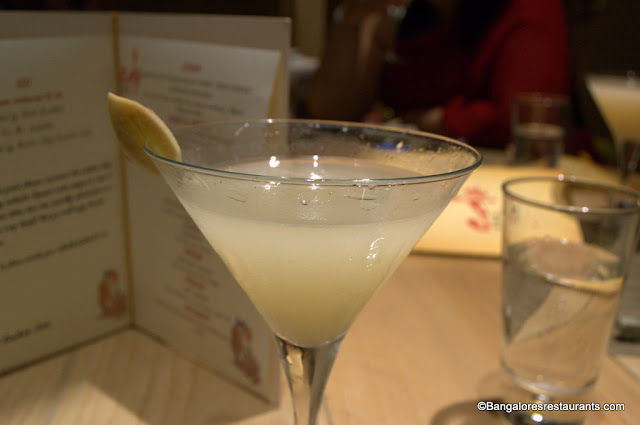 While some at the table found the Ginger version a tad too pungent, I loved mine completely. The cucumber one I hear was great too. 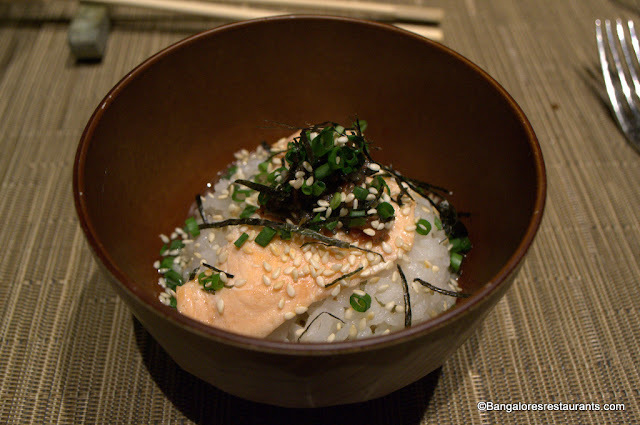 The Syokuji Course - Green tea flavoured rice with Japanese Plum pickle. The light green tea broth forms the base in this bowl, over which is placed some sticky rice. You would think the two don't go together, but it is an interesting marriage of flavours. Topped off wakame, scallions and sesame seeds, this dish completes the train of courses that came our way. 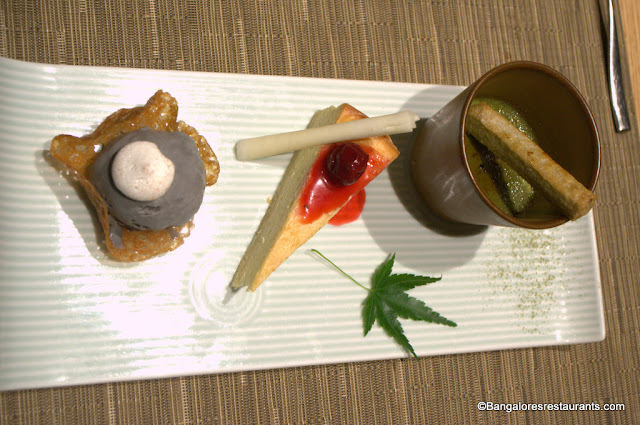 And of course the Mizugashi or the dessert platter - R to L - Green tea creme brulee, the Yuzu cheesecake and the Goma ice cream or the black sesame ice cream. Goes without saying everything tasted wonderful. The Yuzu cake and the creme brulee deserve special mention.